I was first captivated by the work of DC based illustrator Elizabeth Graeber when I saw the book An Illustrated Guide To Cocktails sitting on my friend's coffee table. Written by his pal, Orr Shtuhl and boasting quirky, imaginative drawings by Elizabeth, it focuses on the history and heyday of classic cocktails, including recipes for at-home cocktail hours. Then a few months later, I caught more of her sketches in the form of a Sriracha slaw (!) recipe on Morgan Hungerford West's ever-inspiring Panda Head Blog. I checked out more drawings on Elizabeth's website and was pleased to find that the gal is quite prolific, producing beautiful art in the form of Beatles portraits, coloring books, and yes, food drawings, of yes, baked goods, and yes, pies (okay, tarts)! 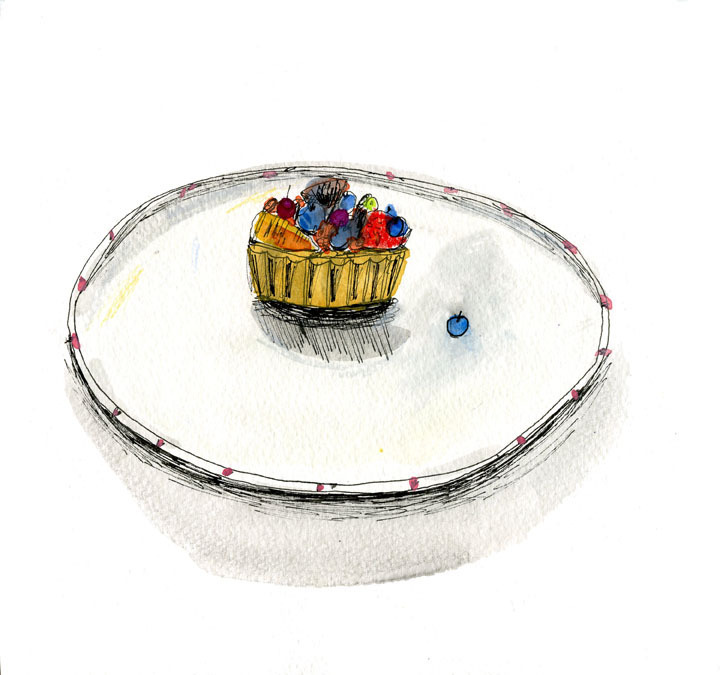 We're hoping to collaborate on something illustrated and pie-themed sometime soon, but in the meantime, check out more of Elizabeth's food illustrations at Food On Paper and in particular, the Small fruit tart drawing pictured above. All pieces are for sale and would look lovely in any kitchen or dining room! Labels: elizabeth graeber, fruit tart, gift guide, illustration, pie art, Washington D.C.